France came out of the First World War with the laurels of a winner and the promise of interesting developments with the little Renault FT, the first mass-produced modern tank. But the vagaries of the Fourth Republic and the choices facing an ageing staff would turn to the creation of a force largely marked by a strong defensive vision, relying mainly on the Maginot Line. French tanks were classified as their counterparts in Great Britain, in infantry and cavalry models, and some “chars de rupture” (breakthrough tanks). Production and testing was relentless in the twenties and thirties, leading to a new generation of armored vehicles in 1935-36, which formed the bulk of the armored forces of France (then numerically one of the largest in the world) in September 1939 (4436). By June 1940, 6126 tanks had been delivered to the army. As far as tank design was concerned, the French engineers came with various innovative designs of their own. The army -partly because of political issues and spending concentrated on the Maginot line- was never given a sizable budget before 1932-34. This forced the use of the existing obsolescent types, the fleet of Renault FTs and the few, but impressive, FMC-2Cs. Renault attempted to modernize its best seller (very popular on the export market) and Panhard courted the cavalry with its armored cars. Both tried to implement the Kégresse track system, an innovative design which turned to be more useful on half-tracks. The mass-produced US M2/M3 models used such a system. The French adopted it for the AMC P16 and many off-road trucks and gun tractors delivered to the Army. Casting was incorporated in French tanks manufacture early on, in 1934-35, first for turrets and then for hulls. The Hotchkiss H35, for example, was the first to be built entirely by cast sections (the hull needed three sections, the driver’s compartment, fighting compartment and engine bay), which helped standardization for mass-production. Cast parts welded together lowered the weight, was less labor-intensive and prevented the risk of spalling. The SOMUA S35 also made great use of an entirely cast hull and turret, also with many large prefabricated parts. Its design remained influential when the US decided to built the Sherman M4A1. Other innovative features were more specific, like the oleo-pneumatic steering system designed to steer the massive hull of the B1 heavy tank. In this case, the driver was also aiming the main 75 mm (2.95 in) gun. Many other tanks allowed some limited traverse for their hull-mounted gun, compensating for the lack of precision of the standard brake-steering system. The French engineers, however, designed a system theoretically giving the greatest possible precision to the driver, allowing accurate traverse. However, this system proved too fragile and complex in operations. French tanks were generally better protected than their German opponents. The reasons behind was their doctrine of use. They were not seen as independent units, but spread among infantry units for close support on the battlefield. For this reasons strong armor was of capital importance, the speed was “infantry pace” and the low-velocity guns were meant to deal with concrete fortifications and pillboxes. These were all related to trench warfare and the experience of WWI. All these models, until 1937 at least, were designed for the same kind of operations practiced in 1918. They were spread accordingly on the battle line, under the good will of saloon generals moving little flags on maps, inside a rigid, pyramidal chain of command. Consequently the French tanks were generally slow (with the exception of cavalry tanks like the SOMUA S35 and scout tankettes) and relatively underpowered, although this was not seen as an issue, since infantry pace was required. Range was also limited by a greater consumption, but the tactical needs were limited in scope to the WWI typical battlefield, a 50-100 km (30-60 mi) area of operations. Radio communication between tanks was sorely lacking, with flags and couriers used instead. The common practice in 1935 was that only command tanks possessed a long-range radio. On the German side, excellent training and communication between tanks and even between armored units and aviation reflected the emphasis put on the delegation of command to the lesser echelons and promoted personal initiative and flexibility. Tank conception reflected this. Mobility was preferred over protection and advanced intercom systems and communication between tanks were commonplace in 1938. Demography was, surprisingly, a critical factor with French tanks design. After the Great War, the demographic pyramid was reversed in France and Germany, resulting in a natality gap largely favorable to Germany, which was crucial twenty years later. After 1935, the French were vividly aware of this, a fact that also reflected in the army’s specifications. To cope with the normal provision of tanks per units, with limited manpower, the only option was to limit the crew to three and design the tank accordingly. The earliest model was the Renault FT, which was armed with a single weapon (gun or machine-gun). Its simplicity allowed a crew of two. But when more complex requirements came, new tank models saw a multiplication of tasks which was not counter-balanced by an increase in crew numbers, nor a new turret design. The commander remained isolated in his single-man turret, with the task of commanding, loading and manning the main gun and the coaxial machine-gun, plus sometimes the radio. The driver and a loader/co-gunner/mechanic completed this busy crew. Consequently, the French tank commanders were overloaded and simply couldn’t cope with other tanks maneuvering around or dealing with several threats at the same time. This helps explain why French tanks units were decimated, despite having better armor. Another issue was the lack of penetrating power of the French guns, the most common being the short APX (Puteaux) 37 mm (1.46 in) designed for infantry support. 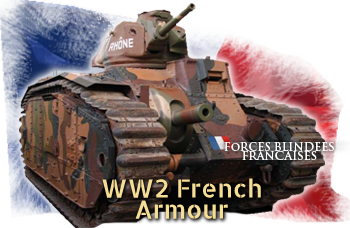 In 1939, the French armored force was most important of the Allies, as the USSR was formally a German ally at the time. A total force of nearly 5,800 tanks, many of which were based overseas, in operational reserve or second line (such as the obsolete FT). The fact that these tanks were designed to establish effective defensive tactics made them slow, poorly armed against other tanks, but very well protected. The B1 bis became legendary for a short time, a terror for German tank crews. At Stonne, one of these tanks destroyed as many as 15 Panzer IIIs and IVs. The Germans would not face such losses until they would encounter Soviet KV-1s and T-34s during Operation Barbarossa. The failure of French tanks was owed to obsolete tactical concepts, compromises which led to undermanned tanks and busy commanders, lack of air support and very poor communication aggravated by a rigid, scattered chain of command. In short, French armor could have had prevailed if better commanded and with better coordination and supplies. The ensuing losses were an incredible waste of military might, reproduced almost to the letter by the USSR in the summer of 1941. There, once more, the biggest armored force in the world was put in jeopardy by similar tactics to those applied in the French campaign, applied on a larger scale, with limited but well-employed forces. The prime doctrinal use was still related to a methodical set of rules based on the trench warfare of 1916-1918. This was favored by the old age of the French staff. The average French general was 70-80 years old, compared to their German counterparts, of average age 45-60. Only the young Colonel De Gaulle stood apart, writing memorandums, reports and a book about armored warfare. He knew well the works of Liddel Hart and Fuller. He saw the full potential of medium and heavy tanks screened by a force of lighter, but faster tanks, in independent, mobile armored divisions. All his ideas were ignored by senior officers, while, in Germany, Heinz Guderian carefully watched all of these theories. Trench warfare vision, without surprise, emphasized slow (infantry pace), but well armored vehicles, only armed for close support, mainly against pillboxes and trench fortifications. The old short-barrel Puteaux SA-18 37 mm (1.46 in) gun was by no means capable of anything else other than engaging fortifications and lightly armored targets at relatively short range. The models which mounted this gun were the Hotchkiss H35, Renault R35 and FCM 36, which partly replaced the old FT. Cavalry tanks like the SOMUA S35 and the AMR-33/35 tankettes inherited the standard cavalry doctrine, having to exploit any breakthroughs and piercing well into the rear enemy lines, disrupting communications, stopping reinforcements and destroying depots and other high value targets. For the most heavily defended lines (such as the Siegfried line), massive breakthrough tanks and SPGs were required. In 1935, these requirements were embodied by the B1 and the old FCM-2C. No true SPG, except very few modified FTs, were designed before 1939. Armored cars were intended to provide screening, scouting missions and patrol regular border roads. The rest is history. The French fought hopelessly, completely disorganized by the speed of the German combined attacks. This was deepened by lack of training, weak and poorly coordinated air support, inadequate tanks, lack of modern equipment and, most of all, outdated tactics. As Guderian’s armored group, the “falx” coming from the Ardennes, was a single, exceedingly stretched line, the French mounted several counter-attacks with all tanks available. Two of these, at Montcornet and Laon, were led by De Gaulle. All failed, notably because of relentless air attacks. Entire units were immobilized and many tanks abandoned due to the absence of fuel supplies. Most transport lines were slowed down by refugees or destroyed by air attacks. During the end of May, when the best French units had been already decimated in the North, what was left of the tank brigades was gathered locally to built the so-called “Weygand hedgehogs”, used as mobile pillboxes. The Germans simply bypassed these with their mobile units, spearheading into the south, and all resistance pockets were left to the infantry, artillery and Stukas. They were subdued with minimal casualties for the Germans. The Maginot line was a complete mess which retained sizable French forces to no effect. After the armistice and until 1943, France was cut in two, on a line which roughly stretched from the very southern tip of the French Atlantic coast to Switzerland, making a bow on the river Loire, just south of Tours and Bourges. This half was placed under the authority of a legitimate (at least recognized by most countries) French Government settled at Vichy. Its position as a neutral, but “collaborating” nation, was radicalized in time in terms of collaboration with the occupying German Forces, and the resistance movement grew accordingly. The fact is that the French empire still possessed territories and powerful military assets in its hands, especially the Fleet, that interested or threatened the Allies in their reconquest plans. The French colonies in North Africa still possessed armored vehicles, mostly obsolescent models, like Renault FTs, a few Renault D1s, some Hotchkiss H35/39s and Renault R35s, alongside many armored cars. These vehicles were committed in various engagements against Allied troops, like against the Australians in Syria-Lebanon and the US and British troops during operation Torch. In French Indo-China, in 1941, the few FTs still operational were used against a Thai invasion supported by Japan. A few AVFs saw action with the Free French under Gen. Leclerc (Koufra raid). Starting in November 1943, as an answer to the Allied landings in North Africa, the Germans took hold of unoccupied France. What was left of the Mediterranean fleet was scuttled. Admiral Darlan, the Vichy authority in North Africa, decided to side with the Allies. The first operations for the Free French came in Tunisia, against the Africa Korps retreating from El Alamein, now reinforced by Kesselring’s Panzerdivisions. Ill-equipped for this, the French fought bravely, but to no effect, as the Allies took the brunt of the attack. This triggered the construction of an entire Free French army under US supervision, with US supplied equipment (through Lend-Lease) and organization (despite De Gaulle’s protests). When the French 1st Army (under general De Lattre) landed in Italy, its force comprised mostly infantry -the rugged Goumiers and other African colonial troops which counted 50% of the original 130,000 men, with artillery support, jeeps, trucks, M5 half-tracks, M3 scout cars, a few M3 Stuarts and some M4 Shermans. When the Free French 1st Army landed in Southern France in August 1944 (Operation Anvil Dragoon), it had three fully fledged armored divisions (1st, 2nd and 5th). They were equipped with M3s and M4 Shermans, receiving some M10 Wolverines in the fall of 1944. It took part in the fighting at Vosges, Colmar, the Rhine, Strasbourg, captured Karlsruhe and Stuttgart and cleaned most parts of southwestern Germany and the Black Forest. After the war, these US-built vehicles were used during the Indochina war (1945-54) and Algerian war of independence (1954-62). Like many other nations of the time, France relied on armored cars to patrol one of the best road systems in western Europe, due to their availability and ease of production. 50 built for service in the North African colonies. Only 50 such half-tracks were built in 1928, plagued by various faults. Six-wheeled vehicle designed as a troop transport, armed with a 37 mm (1.46 in) gun and a Reibel machine-gun. 60 built in 1935, with 9 mm of armor, armed with a 37 mm (1.46 in) gun and a Châtellerault 7.7 mm (0.3 in) machine gun. All-terrain vehicle equipped with a QF high-velocity 25 mm (0.98 in) gun and a coaxial machine gun. The AMD 40 was an improved model sporting a new turret and a more powerful 47 mm (1.85 in) anti-tank gun. 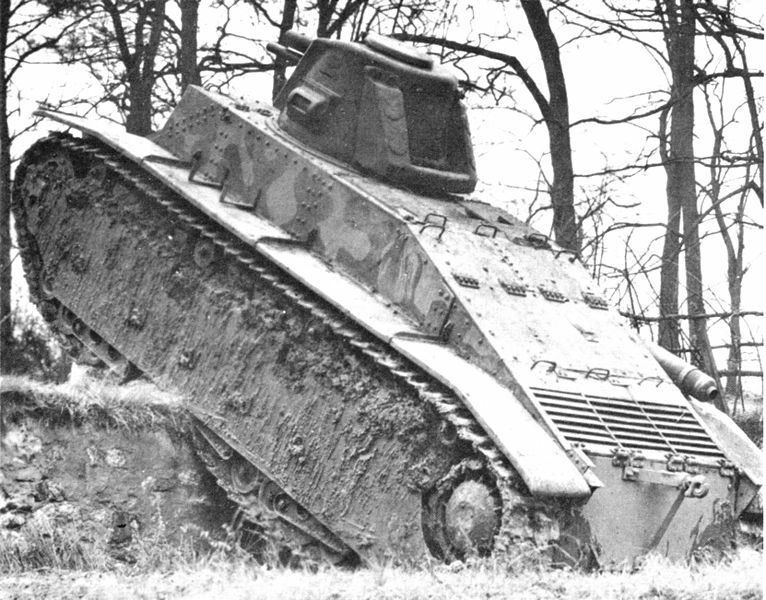 100 such half-tracked vehicles were built between 1928-31. 96 converted and modernized vehicles in 1932, based on the body of the old White armored car. Based on the old Laffly 1918 chassis. Already obsolete in 1934 when it entered service. Served only in Tunisia. Since the introduction of the Renault FT in 1918, France favored large fleets of light tanks for infantry support. Medium tanks were mostly regarded as cavalry models, able to deal with other tanks, while the heavy ones were meant to make breakthroughs and deal with any opponent in the process. The bulk of the French armored forces was, by far, composed by the immense fleet of now obsolete Renault FT tanks. Many were sold, some modernized and others sent to the colonies. Those still extant were now in reserve or used as training machine. Between 1923-26, Renault made several attempts to modernize the FT fleet with the NC lineage and Kégresse derivatives, using the brevetted soft track system invented by Adolphe Kégresse. Nonetheless, production was insignificant. The Vickers Carden-Loyd tankette had some influence over French designs. The AMR 33, AMR 35 and AMC 34 were basically scout tankettes, comparable to the British Light tank models and the German Panzer I. Also inspired by the British design was the unarmed Renault UE supply tractor, the most produced tankette in the world aside the British Universal Carrier. Renault later came with new models, the D1 and then the D2, built in 1931-35. But both remained unsuccessful. In 1935 Renault produced the R35, an answer to Hotchkiss and its H35. Both were designed for the same specifications, calling for a mass-produceable light tank purely for infantry support. Both were simple, affordable, well-protected, but also slow and with the same 37 mm (1.46 in) short barreled gun designed to deal mostly with concrete pillboxes. They were upgraded, some receiving radio sets and a longer barrel to deal with other tanks, but these came too late. 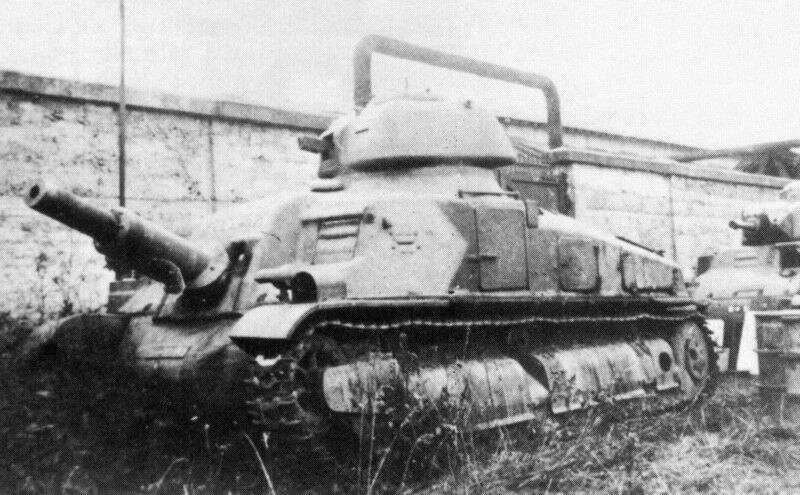 One of the best designs was Renault’s AMC 35, the first French tank with a three-man turret, but too few were built in time. 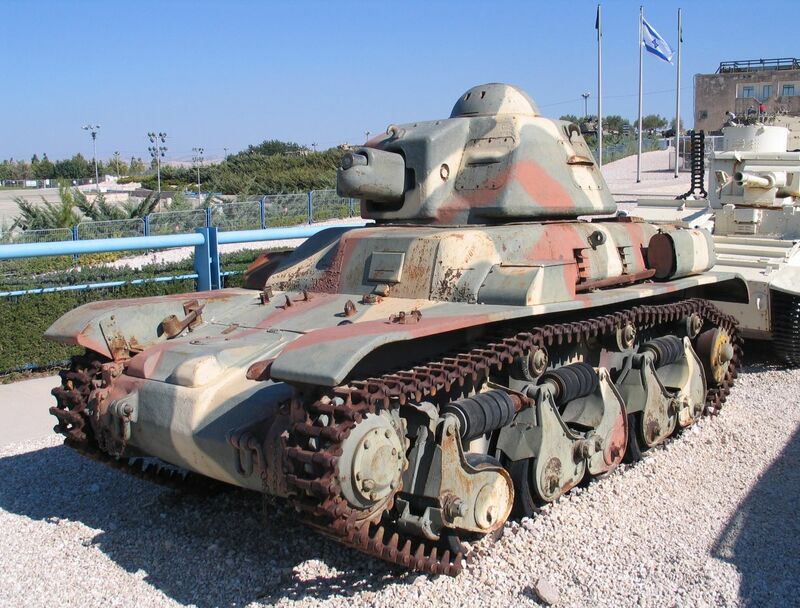 It was equipped with a gun meant to deal with other tanks, the 47 mm (1.85 in) model 1933. Puteaux manufactured most of these guns and cast the turrets. Light infantry tank with a strong sloped armor, mounting a short-barreled 37 mm (1.46 in) gun and a MAC 31 machine gun. 100 produced between 1938-39. Two other orders were canceled, the provider increasing the price of its machines from 450,000 to 900,000 francs. Mass produced infantry light tank. Slow, armed with a short barrel and a machine gun support, but very well protected. Formed the backbone of the French armored forces in 1940. H39: A modernized version of the H35 developed later (1939-40), significantly faster and better armed. Fast tank armed with an anti-tank QF 25 mm (0.98 in) gun coupled with one or two 7.5 mm (0.295 in) machine guns. The last Renault design, a light tank armed with a 47 mm (1.85 in) gun and a coaxial Reibel/Hotchkiss machine gun. Two man turret. These fast tankettes were similar to the British Vickers Light Mk.III. They were used as armored reconnaissance vehicles. Improved version of the AMR 33. Armed with a single 7.5 mm (0.295 in) Reibel or a heavy 13.2 mm (0.52 in) Hotchkiss machine gun. These light infantry tanks succeeded the FT. Their armament consisted of a long-barreled 37 mm (1.46 in) SA34 gun and a MAC 31 7.5 mm (0.295 in) machine gun. 160 vehicles built between 1929-1930. Improved light infantry tank, with a SA35 47 mm (1.85 in) gun and two MAC 31 machine guns. In 1939, 600 of these small FTs were still in the French defense forces, barely modernized. Two versions were available, the FT “canon” with a 37 mm (1.46 in) Puteaux SA18 and another version with a 7.9 mm (0.31 in) Hotchkiss machine gun. No such vehicle was in French service. About 40 were exported and around 11 prototypes existed including the NC31, direct ancestor of the D1 tank. A mass-produced light tank for infantry support with the short gun Puteaux 37 mm (1,46 in) gun and a coaxial MAC-31 machine gun. 765 such vehicles were fielded by the French in 1939 . R40: Improved version of the R35 with a long SA38 37 mm (1.46 in) gun with good anti-tank capacity and 60 mm (2.36 in) of armor. For a long time, the vision of General Estienne prevailed in regards to tank design and deployment. Emphasis was on overwhelming the enemy with a swarm of light tanks, which were a cost-effective solution, being less expensive and with smaller crew. The French army still needed better tanks to exploit gaps in enemy lines and make deep penetrations, and this role was traditionally taken by cavalry units. These were supplied, until then, with armored cars and scout tankettes (also classed as “armored cars”), the only vehicles allowed by law. The political mood changed when faced with German rearmament and moves in central Europe, towards Austria and later Czechoslovakia. The law was amended to allow the cavalry to acquire real tanks, and its first choice was to purchase the SOMUA S35, one of the best tanks in Europe in 1935. A medium cavalry tank that remained only a paper project, designed by AMX (formerly SOMUA). It was characterized by a well-rounded hull and turret, had more ammunition, torsion-arm system suspension with four 82 cm (32 in) roadwheels, was faster and possessed a radio compared to previous vehicles. It was a 20-ton tank propelled by a 160 HP engine. It was scheduled for production in mid-1941. Medium cavalry tank with a cast hull, fast, well-armed and well-protected, but costly. Few were produced, with about 430 delivered by May 1940. A close evolution of the S35. It replaced it in production in May 1940. It was faster, mounting a new diesel with 220 hp, and had larger track links. Unfortunately, very few were delivered on time to serve during the campaign. Successor of the B1, three prototypes produced. Heavier armor, 47 mm (1.85 in) howitzer for anti-tank purposes, 2 or 3 MAC machine guns (one in an anti-aircraft mount) and a flame thrower. A successor for the B1 studied and tested too late for mass production. Improved version in all respects with 80 mm (3.15 in) of frontal armor, 4 men crew, a 75 mm (2.95 in) hull-placed howitzer, completed by a high velocity SA39 47 mm (1.85 in) gun in a turret to counter other tanks. B1: Prototype ready in 1930, production limited to 35 units. 47 mm (1.85 in) gun in the turret and a 75 mm (2.95 in) howitzer mounted in the hull. B1 bis: Improved version with a new APX-4 turret with a SA-35 high velocity AT gun and 60 mm (2.36 in) frontal armor. 369 units built by June 1940, approximately 340 operational in May. The most impressive asset of the whole French arsenal. The B1 ter was never put in service. It was protected by sloped armor and had a more powerful engine. Super-heavy tank planned in 1916, designed in 1917 and built in 1921 after many changes. Ten produced and retained for propaganda reasons. 70 tons, propelled by two diesel V6 Maybach engines, with 45 mm (1.77 in) of frontal and turret armor, a 75 mm (2.95 in) APX 1897 gun, four Hotchkiss machine-guns, with a crew of 12. Minitracks.fr, comprehensive monographies about WW2 French AFVs. The Renault FT-31 (or “modifié 1931”), a limited upgrade of the WWI-vintage famous Renault FT, which was applied to all the 1580 FT machine-gun versions still in depots at the time. The gun versions were scrapped and their Puteaux guns reused on new models. They were rearmed with the compact MAC Reibel 7.5 mm (0.29 in), a gas-operated machine gun, firing 750 rpm at 830 m/s (2723 ft/s) muzzle velocity, originally created for the Maginot line in 1931. It was the main French tank machine-gun by 1940, also operated by the AMR 33/35, Hotchkiss H35/39 and Renault R35/40. FT-31 of the 31 BCC (“Bataillon de Chars de Combat”), May 1940. 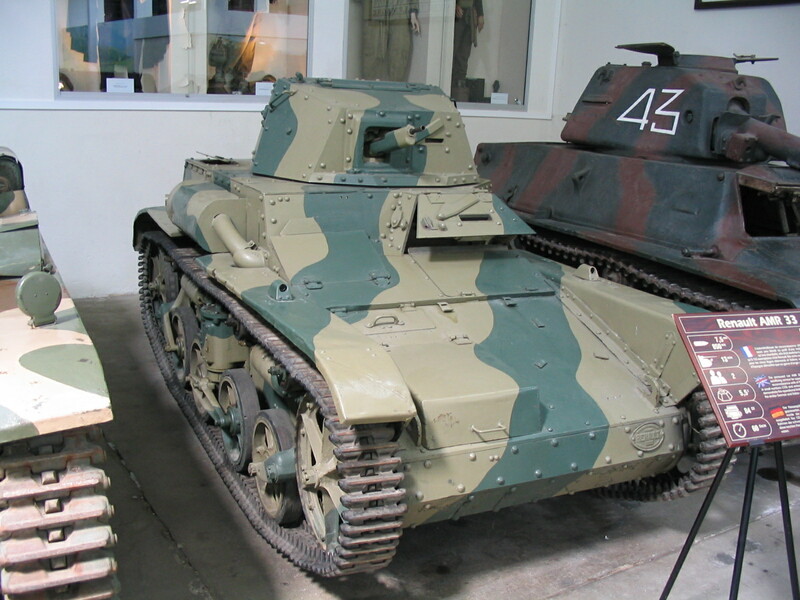 The Hotchkiss H35, the only tank produced by the famous gun manufacturer (of American origin). The H35 was innovative with hull assembly in three prefabricated cast sections. It was a slow, weakly armed, but well armored infantry tank for the time. Hotchkiss H39 at Saumur. Saumur musée des blindés (tank museum) has the world largest collection of French WW2 and WW1 tanks in the world, along with 600 tanks of other nations, mostly of WW2 era. 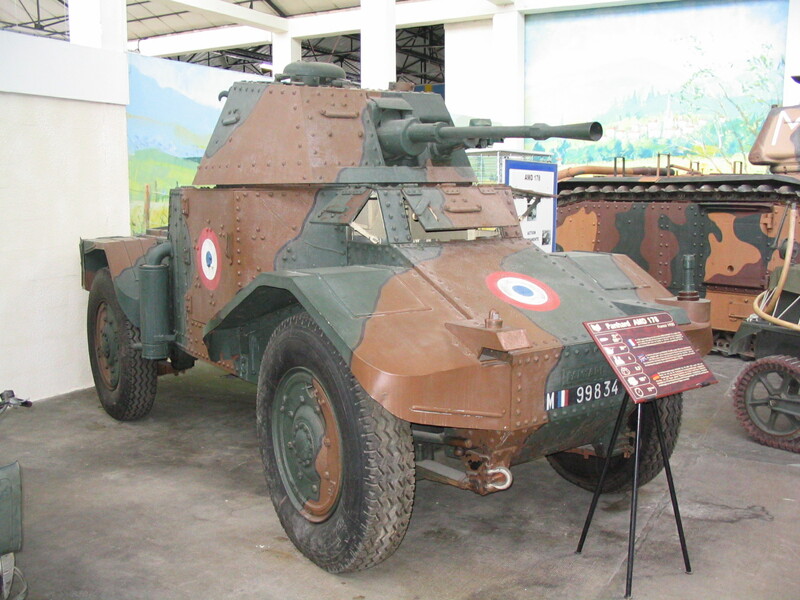 Panhard AMD 178, one of the most successful French armored scout cars. 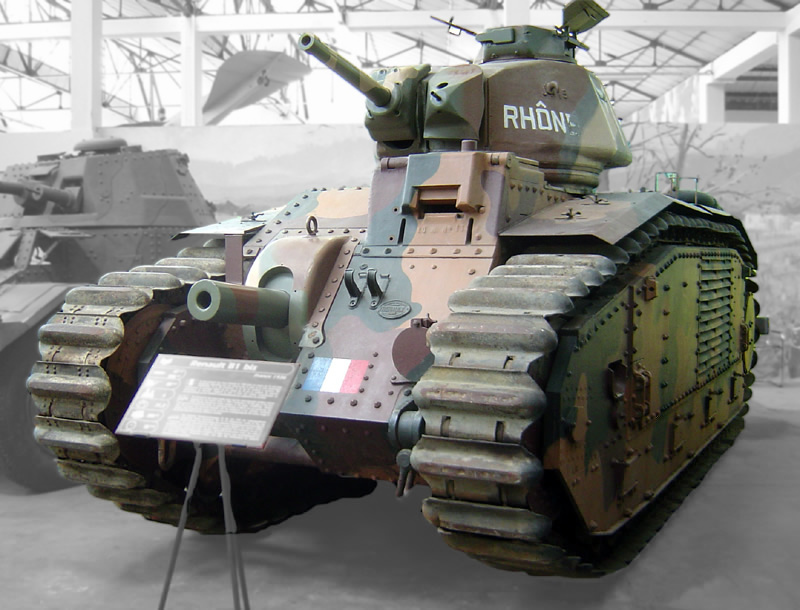 AMR 33, a fast cavalry French reconnaissance tankette, influenced by the British Carden-Loyd designs. 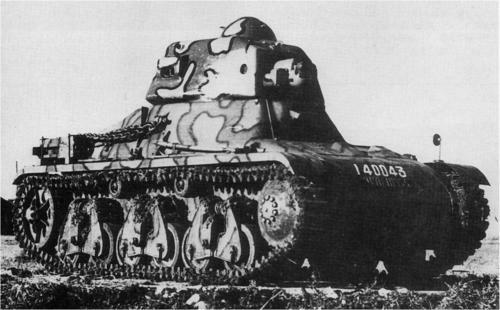 Renault R35, one of the most prolific infantry tanks of the thirties. The Char B1 bis forged a legend of its own during the desperate counter-offensives of May 1940, notably at Stonne. Nearly impregnable, well-armed, it was the nightmare of all German crews during the battle of France. Fortunately for them, poor coordination, no air support, lack of orders, ammunition and fuel prevented full effective use. They saw a second career on the Eastern Front, against the well-armored Russian tanks. 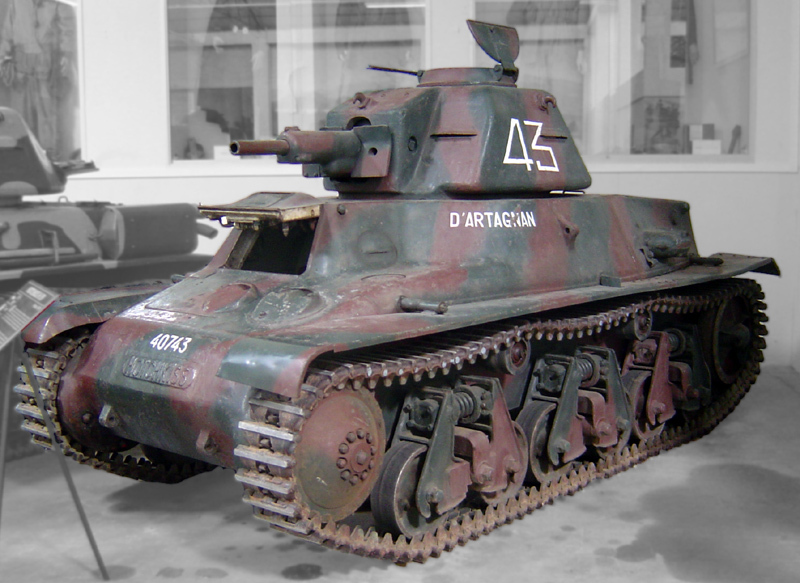 Char D2, a follower of the earlier Renault D1 infantry tank. Very well protected, with essentially low velocity guns meant to deal with lighter tanks and all kind of casemates and blockhouses on the battlefield in a relatively static war. Char SAu 40, an attempted SPG based on the SOMUA S35 chassis. It was armed with a 75 mm (2.95 in) howitzer, but the 47 mm (1.85 in) gun in the turret was replaced by a Reibel machine-gun. 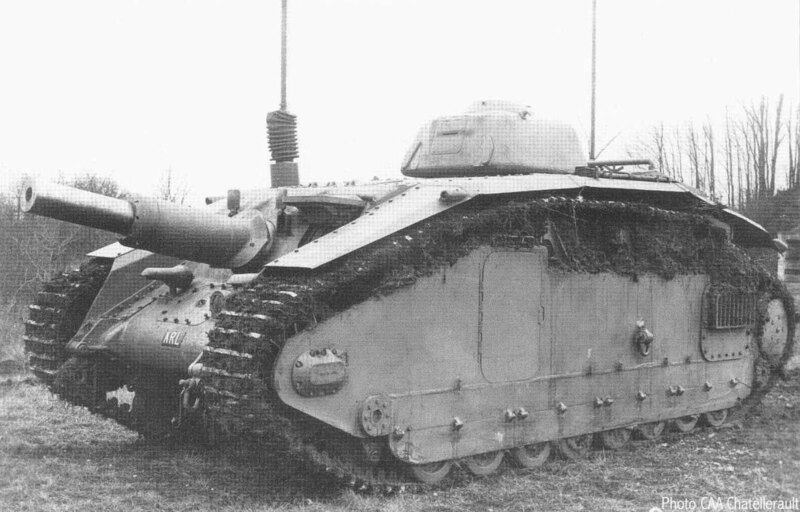 Char ARL 40, a prototype SPG tank-hunter, armed with a 75 mm (2.95 in) APX gun. It was capable of 42 km/h (26 mph) and scheduled for production in June 1940. Thanks for the appreciation. All the best! Totally agree with Jack. Wonderfully informative site – and thx for the link back to my website (alternative finland) – I have to admit I sourced some of my information from your excellent website. Knowing the hard work that goes into this content creation, I can only say you’ve done a magnificent job. Under the Free French Section the link to the M4 Sherman says M5. I’m guessing this is a typo. It was. Thanks for spotting ! That’s an interesting theory I’d never heard before, regarding the birth rate in France being linked to tank crew size & numbers. On the subject of French tank commanders only having wireless, would that be company commanders or platoon commanders? Were the Free French forces ever given a Sherman Firefly? It says week, should be weak. Just a small error. What about the Char G1 project? The project to replace the D2? well you’ll get there at least. Cheers from the NA servers of WoT to those on non-NA servers! Hi, I am a massive Armoured vehiclem fan, and seeing how thism is the french page, Id like to ask where the AMX36 is. I see that AMX40 recieved a small description, but what about its little brother? Is there an emai I might send a photo to of an unknown – probably French – tracked vehicle from WW2? ARL-44 is pretty much a post-war vehicle and they didn’t quite copy the King Tiger, the ARL is quite different in a lot of respects (not better, different).